Quite an exciting time for Airbus. 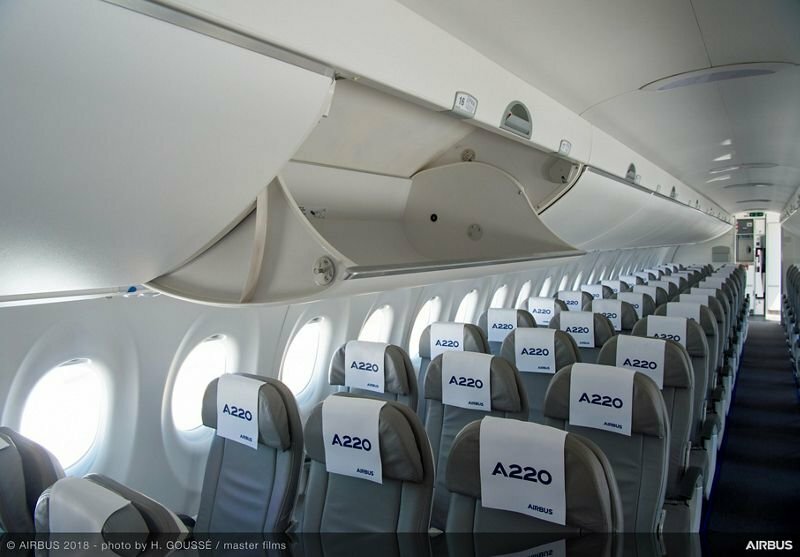 Airbus just introduced the newest model in their commercial aircraft product line-up - the A220. On the same day, the U.S. airline JetBlue announced a substantial order for the aircraft. The aircraft was also featured with full exposure at the 2018 Farnborough International Airshow. 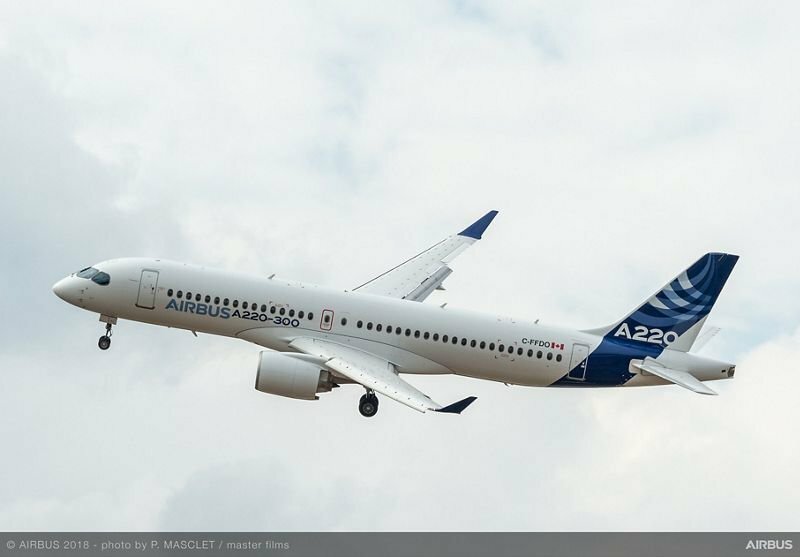 The new Airbus A220 is actually the old Bombardier C Series. The Bombardier C Series was developed by Bombardier Aerospace as an offering in the 100 to 150 airliner market. 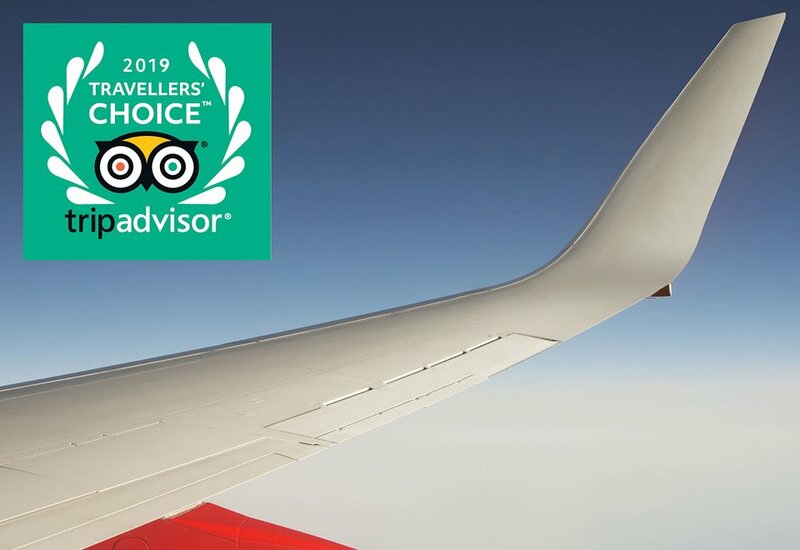 It features a wide cabin, Economy Class seating configured as two and three seats per row, 18 to 20-inch Economy Class seat width, large overhead bins, extra-large windows, and advanced quiet engines. Two aircraft - the 108 to 133 seat C110 and the 130 to 160 seat C130. Later, the names were changed to CS100 and CS300. 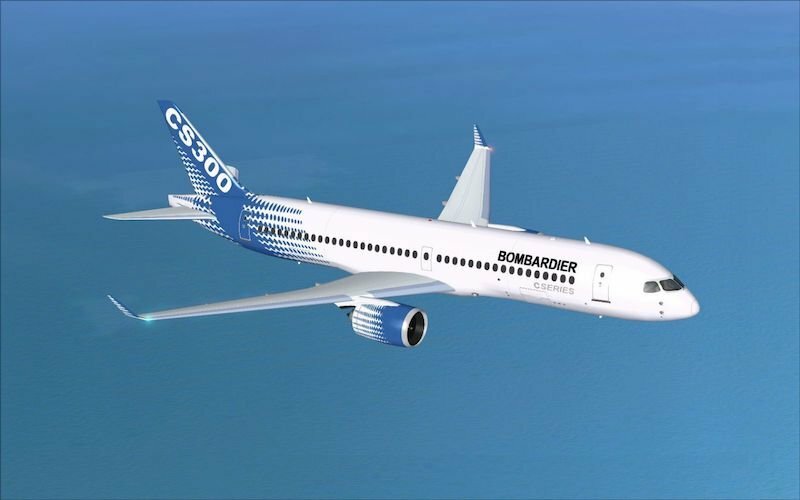 Maiden flights occurred on 16 September 2013 for the CS100 and 27 February 2015 for the CS300. First deliveries to the airlines occurred on 29 June 2016 for the CS100 to Swiss and 28 November 2016 for the CS300 to Air Baltic. Aircraft assembly under Bombardier occurred at the Montreal Mirabel International Airport facility in Quebec, Canada. Unfortunately, development of the aircraft did go through some trying times. Issues with engine failures, flight test certification, and company financial problems delayed the final approval for delivery from 2013 to mid-2016. Due to the delay, orders for the aircraft were adjusted and cancelled. Cancelled orders and additional costs to gain certification added to Bombardier’s financial problems. Help from the Canadian government, Quebec government, and banks kept the program going. An interesting fact is that Airbus actually had a chance to take over the C Series program in October 2015. It declined. However, two years later Airbus decided to acquire a 50.1% in the C Series program. 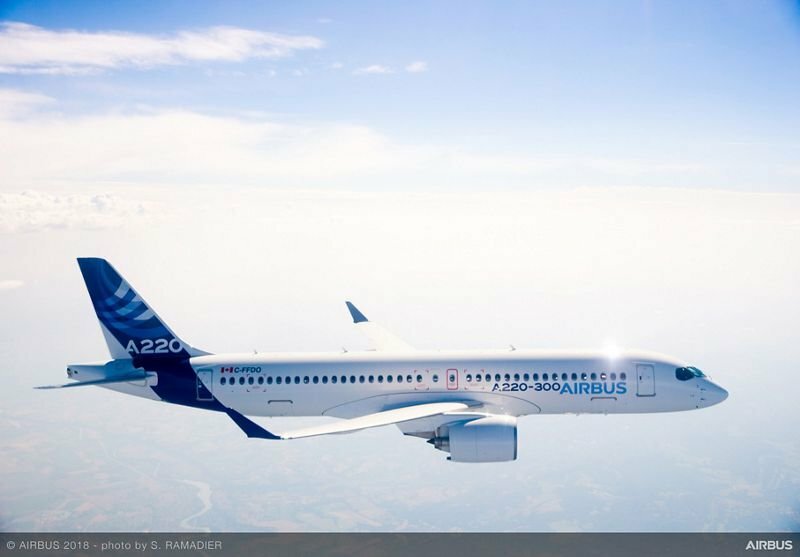 Airbus’ interaction with the program offered a better parts supply chain, marketing program, and the ability to assemble the aircraft at their facility in Mobile, Alabama. The last factor is a huge part of successfully marketing the aircraft in the United States. Bombardier was accused of “dumping” the aircraft in the market with its deeply discounted prices in a deal with Delta Air Lines. Consequently, a tariff of 300% on each aircraft sold to a United States company was proposed, debated, and dismissed. Airbus introduced, on 10 July 2018, the A220-100 and A220-300 in Airbus livery. It's the same aircraft as the C Series but now it is in colors for all of the world to see that it is part of the Airbus commercial program. Airbus has started marketing extensively. It has three aircraft for viewing and demonstration flights at this year’s Farnborough International Airshow. The rebranding will be very beneficial as Airbus has stated that they have the offering of all size aspects of commercial jet aircraft covered. Who is or will be flying the A220? JetBlue made splashy news on Airbus’ introduction day by announcing an order for 60 aircraft with an option for an additional 60. 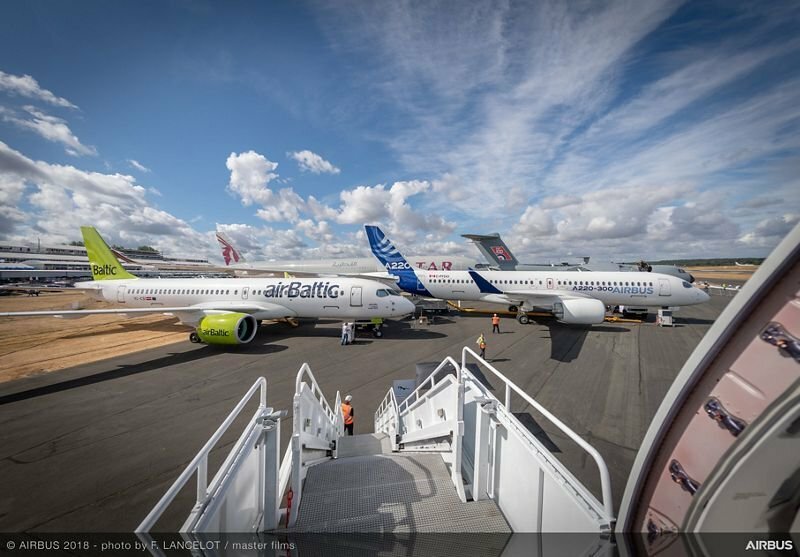 Another order for 60 aircraft occurred at the 2018 Farnborough International Airshow from a start-up U.S. airline group headed by the former founder of JetBlue, David Neeleman. 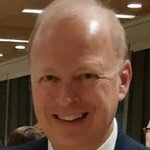 Air Baltic, Korean, and Swiss currently have the series in their fleet with additional units coming on in future. Air Canada, Braathens, Delta, EgyptAir Express, Republic Airways, and several aviation leasing companies representing airlines have orders in place. The excellent marketing initiative and credibility of Airbus will surely bring in more. The future looks promising for this small jetliner.